Huge, stupendous congratulations to everyone involved, whether you helped to organise the various events, donated prizes, took part or came to watch. 1st and 3rd year RE classes were remarkably quiet as they took part in sponsored silences to raise funds for Lenten Charities. Many congratulations to Nicholas Divers, 3A2, who single handedly raised £60!!!! Andrew House had aimed at raising £200 but has far exceeded that figure. 6C with 6A: movie and music quizzes. Money is still coming in from sponsored events – total soon! We organised the face painting for Thursday 20th March. Beforehand we contacted the Performing Arts department and arranged to use the theatre for the event. We advertised the face painting by putting posters around the school and putting announcements out at assembly. On the day we received a fantastic turnout! We raised around £41 for SCIAF. The face painting was arranged by Elizabeth Low, Dominique Larkin, Amanda Miller and Victoria Cook with the help of Nicola McLindon, Kimberley Toner and Hannah Lester, along with a few 6th years. Result was 1-0, a magnificent solo effort from John Tempany, who received a pin-point John McGuinness pass just inside his own half, slalomed past 3 defenders, cut inside and unleashed a rocket from fully 25 yards past the helpless Kevin McGuire!!! Mr Duff, Mr Law, Mr Martin, Ms McArthur, Mr McGuinness, Mr J McNaught, Mr A Smith, Mr R Smith with 4th year pupils Conor Smith, Connor MacGowan, John Tempany, Calum Walker. Michael Devlin, John Robertson, Daniel MacKinnon, Christopher Murray, Craig Queen, Barry Eley, Mark Sinclair, Daniel Canning, Peter Galbraith, Daniel Burns, Kevin McGuire, Matthew MacDermid. Thanks, Mr Smith. Mind you, it’s not really surprising the staff won: they appear to have aliens on the team (see photo). Isn’t there a rule about bipedal Earthlings only playing football? 50p per guess, with the chance of winning an Easter egg. Cunning souls have put their Maths skills to work, using the radius of the bowl to figure out the volume of the bowl. Unfortunately, the same cunning souls forgot to measure the bowl when it was actually in their company. 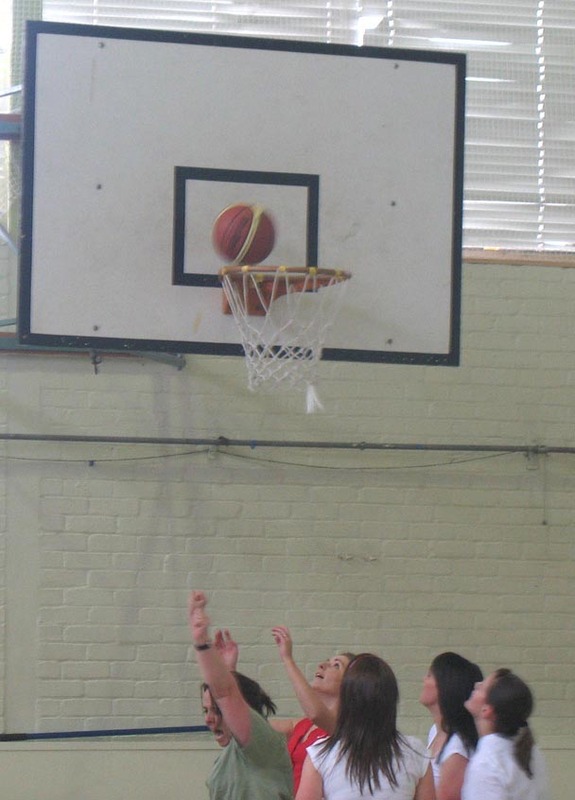 3C organised a sponsored basketball game for their Lenten Charity event. Pupils paid 50p to watch the staff kill the pupils (apparently). Over to our special correspondent, Mrs Fitzpatrick. There is no truth in the rumour that the Staff needed to lie down in a darkened room after the game! Thanks to everyone who supported this event and helped raise £41 for SCIAF. 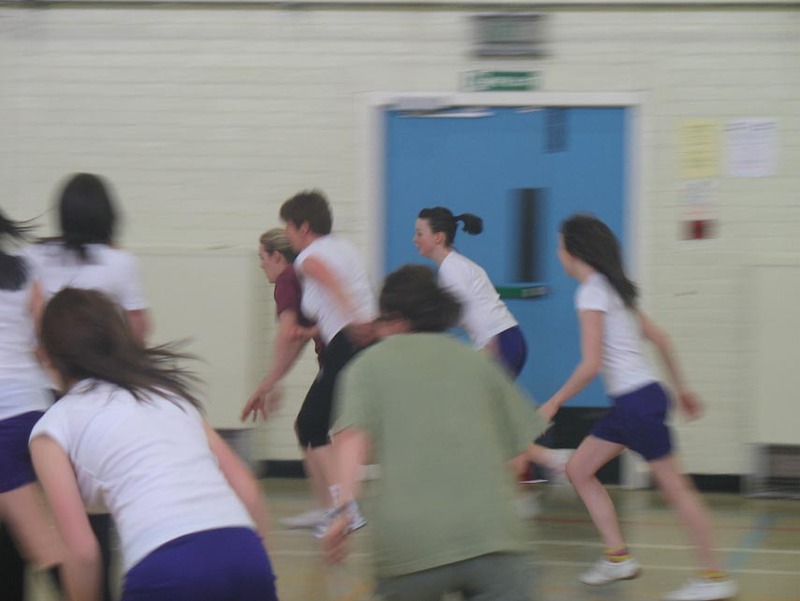 Teams: Mrs Anderson, Mrs Fitzpatrick, Mrs Kerr, Ms O’Donnell, Ms Murray, Ms Newman, Mrs McKay. Stephanie Ferrie, Kimberley Toner, Caitlin Mullan, Sarah Clark, Erin McNally, Elizabeth Low and Amanda Miller. Pupils from 2M took part in a sponsored silence yesterday – for the whole day apart from interval and lunchtime. Pupils carried sheets which were signed by class teachers at the end of each period to prove their lack of talking. The Andrew House Fugitive was apprehended shortly after period 2 this morning. Pupils paid £1 and received a sticker saying, “I’m searching for the Andrew House Fugitive” and followed clues left throughout the morning. The first clue “The Fugitive comes to Our Lady’s everyday” managed to dramatically heighten tension while providing practically no useful information whatsoever. It was intriguing however, that Mrs Anne O’Donnell, normally seen bustling back and forth across the foyer, was mysteriously missing, while an earlier simple request for keys seemed to cause mild panic and indecision to cross her face. Hmm. So congratualtions to Daniel Canning who managed to apprehend the reprobate Mrs O’Donnell, earning himself the bounty of £25. And further congratulations to Andrew House who raised £110 with this event. Six brave souls versus 650 (apart from the ones at lunch). They pulled up their hoods.They borrowed flippers. They laughed in the face of flying sponges and fallen buckets. But they were COMPLETELY soaked by the time it was all over. So a huge thank you and well done to Mrs Anderson, Mr Duff, Mrs Kerr, Mr Law, Ms Newman and Mr Smith for being so brave. Pupils were surpringly keen to assist in this fund-raising venture at £1 for three sponges or a complete bucket with all proceeds going to Lenten charities. And congratulations to to organisers Nicola McLindon, Dominique Larkin, Hannah Lester, Victoria Cook, Sarah Clarke, Kimberley Toner and Elizabeth Low (ably assisted by Mrs Fitzpatrick). Your powers of persuasion are obviously phenomenal (and special thanks for not spilling any buckets of water on me while I was taking photographs). As part of Lenten Charities fund-raising, a fugitive will descend upon OLHS on Tuesday (18th March). Pupils and staff can pay £1 to enter which provides them with a sticker to identify them as participants. Clues will be left throughout the school leading to the identity of the culprit. The winner will receive a substantial prize (but they’re not saying what…). What happens to non-fugitives accosted across the school is as yet unknown. 6th year pupils are taking part in a Hunger Lunch for charity tomorrow. Organised by Depute Head, Mrs Mary Mulholland and Chaplain, Father Stephen Miller, the lunch requires pupils to give up their lunch money in return for bread and water, although our hunger lunchers appear to be a bit up market, with balsamic vinegar and olive oil added to the menu. 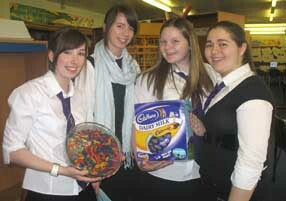 The money raised will go to the school’s Lenten Charities Fund.